Amasty introduces its new Magento 2 tool providing web stores with faster and more precise search, which significantly improves the default platform functionality. Elastic Search for Magento 2 by Amasty extends the company’s broad portfolio of Magento 2 modules, enabling ecommerce merchants to enhance customers’ search experience and speed up their online stores. The module’s rich features are based on the powerful Elastic Search engine, ensuring that users get the most relevant and fast search results. Below, we describe the extension’s functions in closer detail. The Elastic Search module provides advanced autocomplete functionality, allowing to get more exact search results for less time. The search window has a customizable layout and uses a partial wildcard search. With the spelling correction feature, you prevent your website visitors from getting to no search results pages if they mistype a word in a search query. Using the Elastic Search module, you can create dictionaries of synonyms and stop words. In this way, your customers will always find what they are looking for based on the bound product titles in a synonyms list. Also, you can exclude any word from the search results specifying stop words in the backend. The extension supports the search of the full text content within products, categories, CMS pages, and landing pages. Separate content blocks with relevant search results can be added to the popup window according to the needs of your store. Your website visitors can search the desired products by SKU, product names, various attributes, and more. Besides, the module provides the possibility for partial search, as well as using different types of data, like text, numbers, and other. 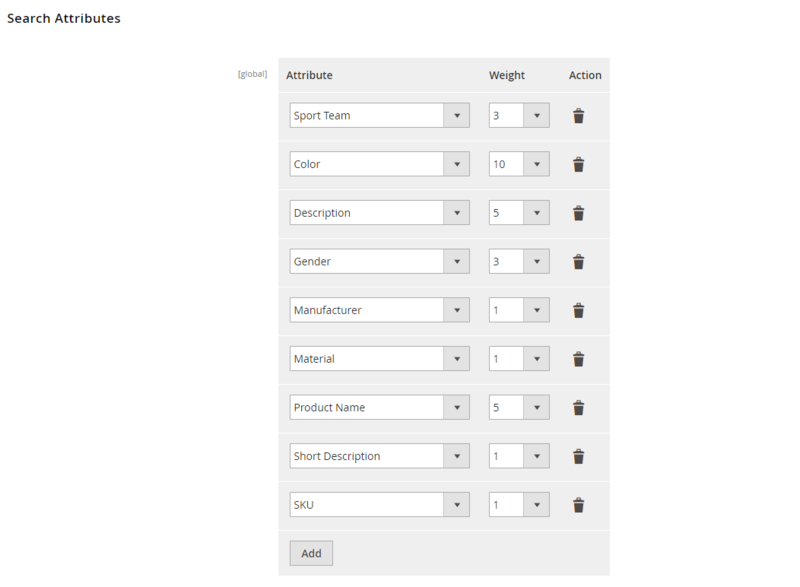 In the backend, admin users can set search type and weight for each product attribute separately. The feature makes search query more precise and allows adjusting search results display according to the specific needs. 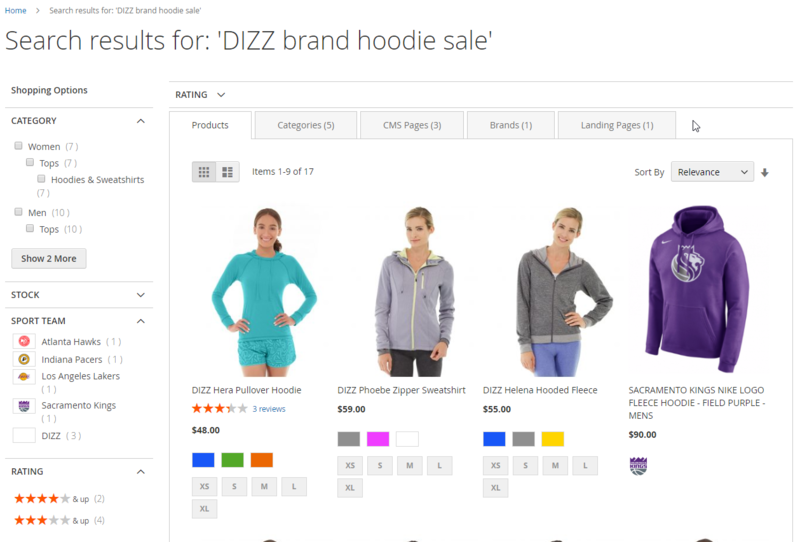 Search by attributes improves frontend user experience enabling shoppers to filter products by color, material, manufacturer, and more. Besides, the module uses Boolean Search, which means that you can define how to combine the keywords for a product attribute. Search results can be sorted by products, categories, CMS and landing pages, and brands and displayed in different tabs on the search results page. It provides more user-friendly navigation when looking for a required item on an online store. You can add separate blocks with recent and popular searches to a search popup to display relevant queries to online shoppers and help them decide on the purchase. The Add to Cart button is integrated into the popup so that customers don’t need to leave the search results window. By displaying product reviews and ratings next to the items in search results, you help customers choose the most suitable product. In addition to design customization options of the search popup, you decide how to display multiple sections in the window. Moreover, the Elastic Search module allows placing out of stock items at the end of the search results list and showing available products first. It is possible to set conditions in the backend to boost or lower specific products display in the search query list. Thus, you can run marketing campaigns by specifying SKU, categories, brands, or other product attributes for the items you want to promote. 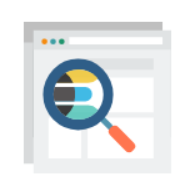 Elastic Search is fully compatible with Improved Layered Navigation by Amasty letting shoppers quickly browse an ecommerce site and have access to broader search results. As for the integration with other extensions, it includes Improved Sorting (more comfortable website browsing by different sorting parameters) and Product Parts Finder (a quick search of product parts and components using different filters). Elastic Search by Amasty indexes lots of products at one time with no limitation on their number, reducing time spent on indexing management. With the multi-language support, the extension enables online shoppers to search for the products they want in their local language. 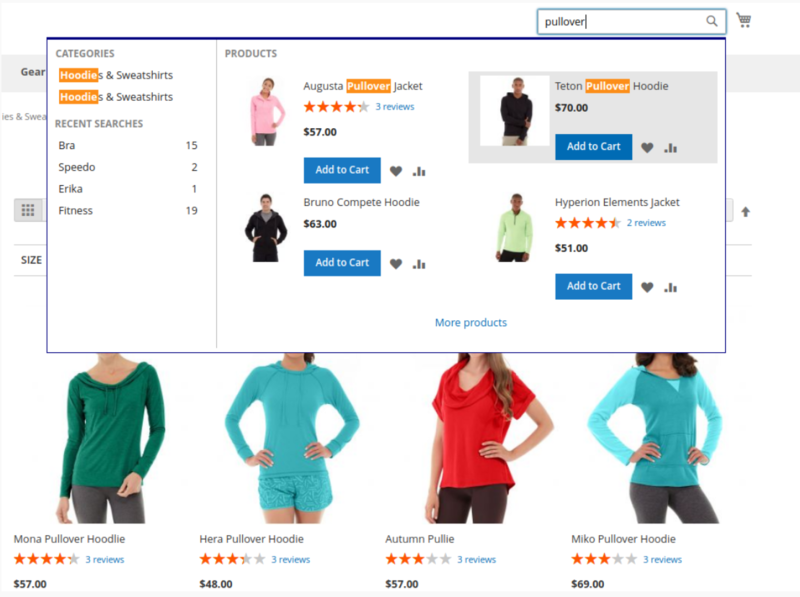 Elastic Search for Magento 2 by Amasty provides users with the customizable mobile-first design. Now, let’s have a look at the backend configuration of the Elastic Search module’s features. First, let’s see how to configure the elastic search settings. Configuration options are located under Stores → Configuration → Amasty Extensions → Elastic Search. Here you will find two sections: Connection and Catalog. In the first section, you can enable the Elastic Search engine (or select MySQL here as another option). Also, here you specify a hostname (IP address) for running the search engine, web server proxy port, and an index prefix per a store. If you want to enable authentification for the Elastic Search server, enter username and password in the relevant fields. Then, set the server timeout. Next, you can check how the Elastic Search is working by clicking the Test Connection button. 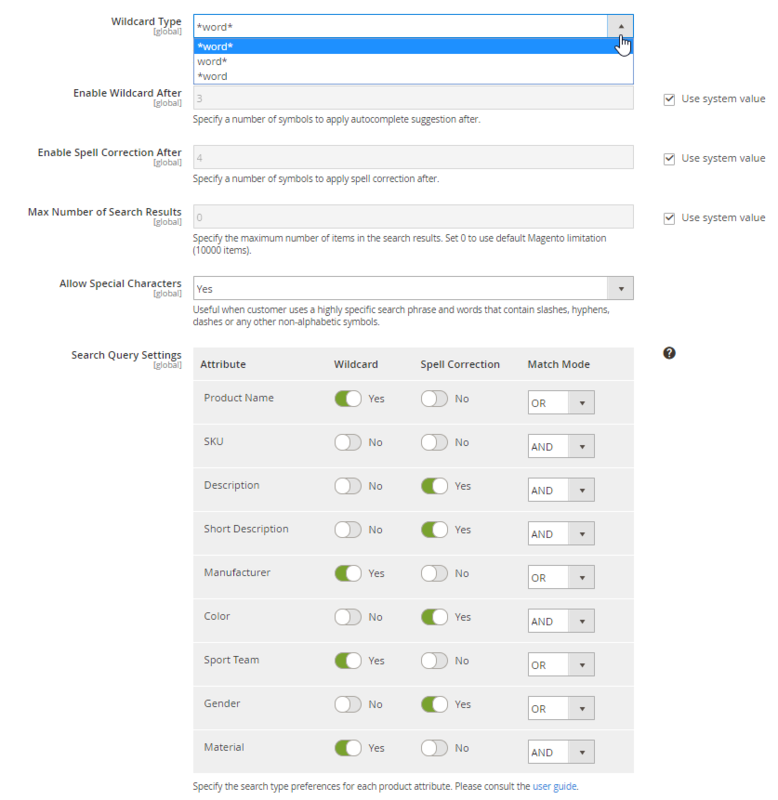 In the Catalog tab, you select Wildcard Type for the autocomplete function and specify values for the following settings: Wildcard After (number of entered characters triggering autocomplete); Spell Correction After (a number of symbols to be entered to apply spell correction); Max Number of Search Results (maximum number of items displayed). Next, enable or disable the usage of special characters in the search field. 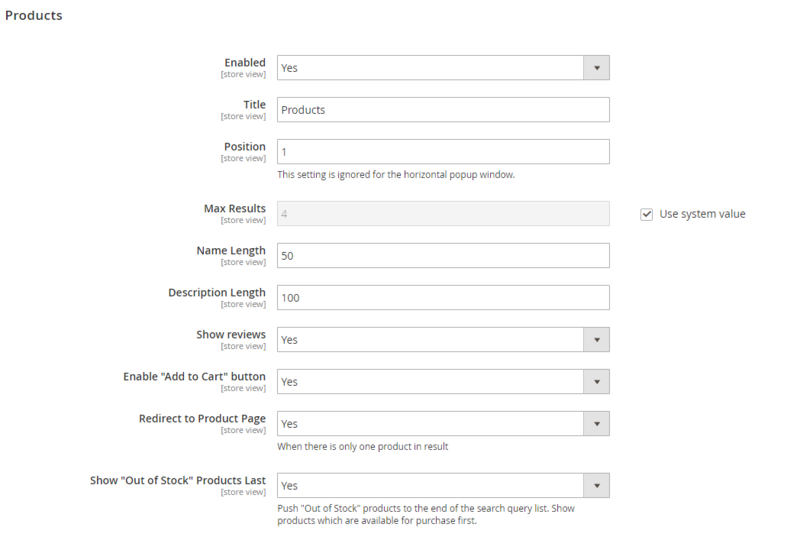 Then, you can set query settings for each product attribute. You can customize the grid by hiding unnecessary columns and changing their order, apply filtering and sorting, as well as delete grid records in bulk. When adding a new synonym, you should specify all words in Synonym Enumeration and select a store view. You can also import synonyms by uploading a CSV file. In the same way, you can set stop words for the Elastic Search engine. Go to System → Manage Stop Words to open the appropriate grid, add a new word, or import stop words via a CSV file. Another group of extension settings is located under Stores → Configuration → Amasty Extensions → Search Pro. There are 12 sections here: General, Search Attributes, Recent Searches, Popular Searches, Categories, CMS Pages, Products, Landing Pages, Brands, Blog, Custom Layout, and Elastic Search. In the first one, you can set the width of the popup window, a minimum number of entered characters to activate the popup, and enable redirect to store search results from a broken URL. Also, here you can create a custom URL for the default search results page to make it shorter and SEO friendly, as well as enable separate tabs for the Products, Categories, CMS, and Landing Pages search results in the popup window. 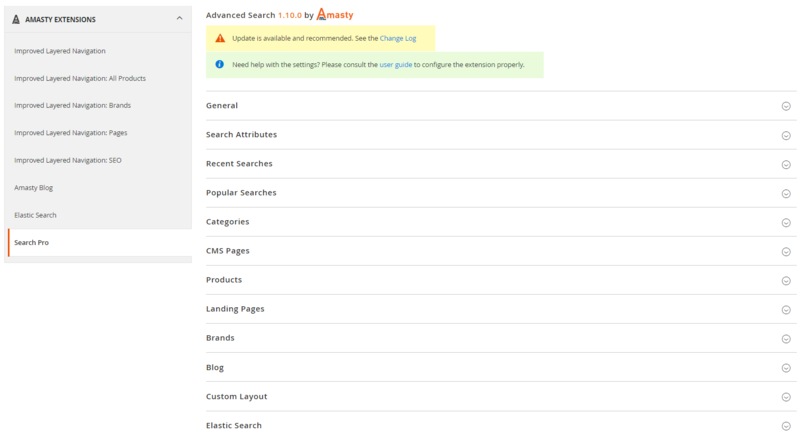 In the Search Attributes tab, you can configure an unlimited number of available product attributes along with their weight (from 1 to 10), which defines search priority. The Recent Searches block allows enabling relevant block in the search popup and the ‘Show on first click’ function. Here you also create a title for the block, set its position, and enter a value for the maximum number of displayed search results. The Popular Searches tab has similar configuration options: enable/disable the function; allow display on the first click; specify a custom title; set block position; enter the number of results to show. In Categories, you configure the relevant block: enable/disable; create a title; specify the position and the maximal number of displayed results; set limits on the number of symbols in category name and description. 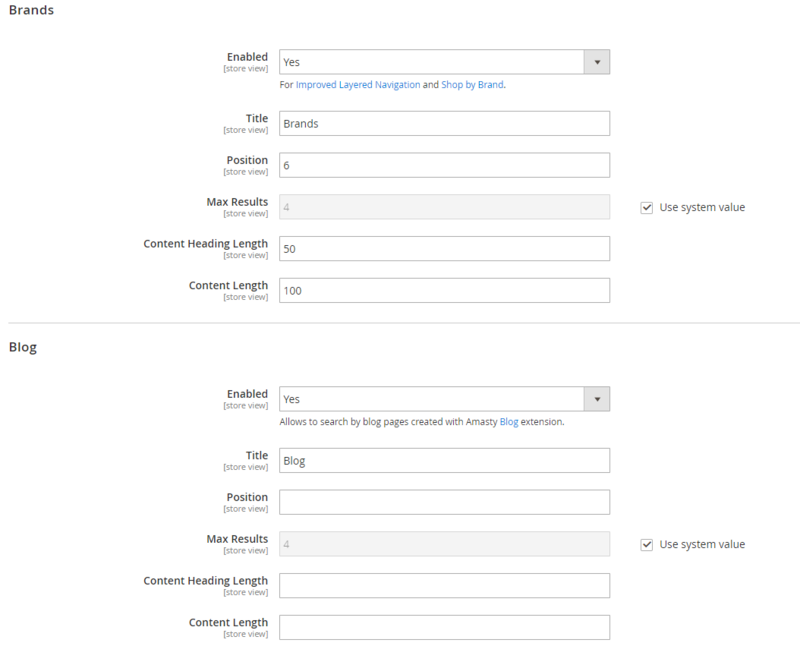 Elastic Search by Amasty lets you configure similar options for the CMS Pages block. In Products, you also enable/disable the feature, specify a title for the block, its position, and max results to display, and set the number of symbols for the name and description length. Besides, you can decide on showing or hiding reviews, enable Add to Cart button and redirect to the product page for search results with only one product, and move out of stock products to the end of the list. For landing pages, you define the same settings as for Categories and CMS pages. Similar settings are available for the Brands and Blog blocks in the search results window. Custom Layout settings allow enabling customization for the search popup and selecting colors for different popup elements like the border, hover, highlight, background, text, and hover text. The last tab shows if Elastic Search is installed on your website. Now let’s see how the backend Magento configuration with the Amasty Elastic Search extension changes user experience on the frontend. When the ‘Show on First Click’ option is enabled, a list of recent and popular searches is displayed. In the example below, Products, Recent Searches, and Popular Searches blocks are displayed in the search popup. When you start typing a query, you see the appropriate products. The title, short description, price, image, and Add to Cart button are shown for each product. Depending on how you set the weight of each product attribute, it will change the search results. For example, if the ‘color’ attribute has 10 as a weight value, and the ‘description’ attribute has 5, search results will be displayed according to the attributes priority. As for the synonyms functionality, below, you can see the example for synonyms list with ‘Pullover’ and ‘Hoodie’ words. The Elastic Search engine is built to make your ecommerce site faster and optimize search performance. 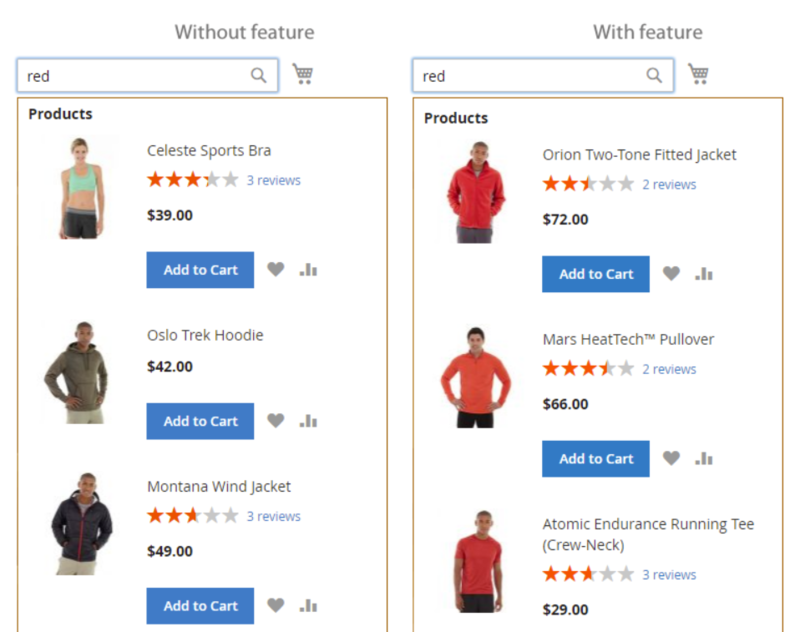 The Magento 2 module provides customers with the most relevant search results and improves catalog layered navigation, allowing visitors to find exactly what they need and bringing more sales and higher conversions to store owners. Besides, with the Elastic Search extension, all the data is correctly indexed, which makes browsing on your website even more comfortable.